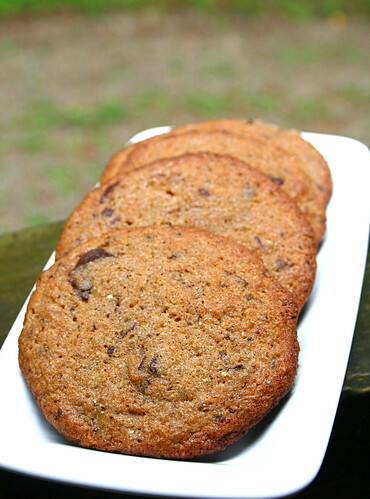 I love the idea of using rye in cookies; I’m going to try this the next time I want chocolate chip cookies. I’m also very curious about this mysterious job! Life in the cabin sounds really nice…other than the internet issues. Never have I thought of adding rye to cookies. It’s only used for bread over here, I guess beacuse of its strong flavour. But now I think, why not? Those cookies look amazing! I’d love to see what you think, especially since you mill your own flour. The flavor makes them pop–in a different kind of way, but in a nice whole-grainy sense. So delicious! I can’t wait to hear more deets about your new job – from the bits you’ve shared, I’m totally intrigued! Those sound so interesting. I can’t imagine a cookie made with rye flour. Very creative! I have been all about simplicity too these days. It just makes life so much easier and so much more relaxing. I am glad you are enjoying the new job. Rye flour in cookies! I can’t even imagine what that must taste like, but I’ll bet it’s good! Great post! I think the cookies sound great. There’s a lot of good nutrition benefits in rye, so I’ll have to find some! Hi, Jes. Thanks so much for your kind comment on my blog—it was so nice to hear from you. These cookies look wonderful. I’m intrigued at the thought of using rye flour for cookies. I just realized as I looked at the date on your post that you and I were making chocolate-chip cookies at exactly the same time! I made a huge batch of oatmeal cookies to send to my children to cheer/fatten them up. Wonderful medicine for certain. For both them and me. I have a giant bag of rye flour on hand, but I almost never touch it, especially for making desserts. What an interesting idea- Maybe it has some sweet purpose after all! Clever! I am making rye bread right now, but cookies seem more appealing at the moment… Thanks for sharing your recipe! These look delicious. I really want to start experimenting with different flours… I need to find someone near ATL who mills their own. Can’t wait to hear about the new gig! Sweet! The cookies look so crispy and perfect! Thanks for the recipe, I am definitely making these next time we go home for a few days. I hope you can get some decent rest soon!